Relaxetin Forte capsules 60 pcs. Bio+Active Brussels sprouts-germ capsules 250 pcs. 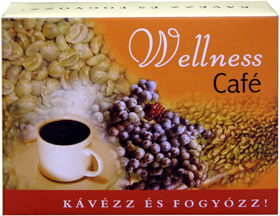 A special mixture of original green coffee and fruit-coffee. Its antioxidant activity is excellent due to its fruit components that help to prevent damages caused by free radicals. High chlorogenic acid content of green coffe-beans, on the basis of clinical studies, is suitable to use it as supplementation of slimming diets. It inhibits fat deposition. In case of continuous use (2-3 cups daily) it won't cause any sudden weight-loss, but it contributes to a perfect slimming. It is recommended to everyone who makes up their minds to lose weight, but don't want to do it by torturing themselves. Ingredients: A product with reduced quantity of caffeine. Original, unroasted, pure green coffee, lyophilized and dried red grapes, black currant, red currant, rose hips, skin and stones of dewberries, hibiscus, green tea, aloe leaves and fructose. It doesn't contain any preservatives! It can be made in an espresso coffeemaker (gurgler), by normal dosage and procedure. Content of the box: 210 g net, enough to make at least 30 servings.